‘ANGELIC BOY’: this is how the Daily Mirror described the murderer of fifty worshippers in a mosque in Christchurch, New Zealand. This text was alongside a picture of the killer at the young age held in the arms of his father. One could suggest that the connotations of the word ‘angelic’ are Godly, holy, and heavenly. These are so far removed from the killer’s actions. 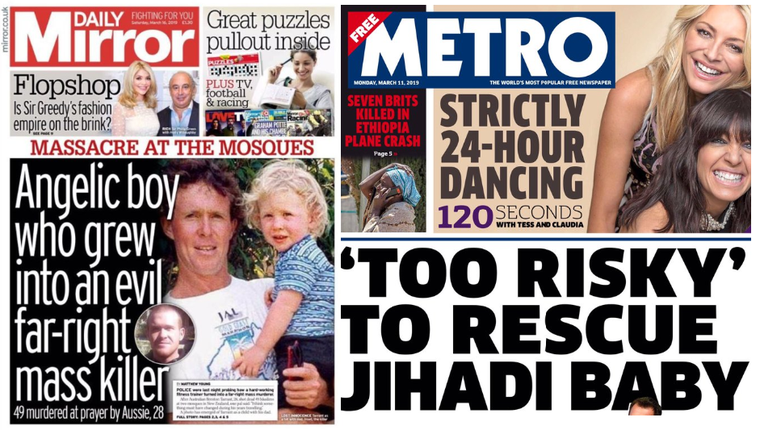 I do not recall seeing any baby pictures of Shamima Begum, the young British Muslim woman who has been stripped of her citizenship, but I did see one tabloid paper call her baby a ‘Jihadi Baby’. Language is incredibly powerful. The people killed were not a number. They were people that went to pray and congregate on a Friday. They were killed when they were at their most vulnerable, in thought, meditation and prayer. These people were human beings. They were mothers, fathers, and daughters and sons. The murderer as a child is featured, along with his father, usurping the front page. The victims have been erased and the murderer has become the victim. Images and words take on new significance when terrorist attacks, like this Christchurch mosque massacre, happen. They connote how we think about those who threaten our way of life, our security, and our pride in living in diverse societies where people of all backgrounds live together and respect each other. It is not for no reason that Brenton Tarrant, like Anders Breivik, wrote a 74 page manifesto before committing mass murder. Words matter. As an English teacher I am completely aware of how powerful language can be. As a person that analyses language all day every day, I understand that with great power comes great responsibility. We need to teach students how to actively critique and analyse text in the media and in all its forms; be it in the print media, or television, or Facebook and online platforms and websites. Our young people need to be able to discern the difference between fact, fiction and pure rhetoric. It is essential for them to be able to recognise propaganda for what it is. They need to be able to question it and counter-argue it, at every given opportunity. In the new specifications from the Department of Education, the Media Analysis piece of coursework has been removed from the English curriculum. In the previous curriculum, students needed to prepare and write a piece of work – as coursework or controlled assessment – consisting of a detailed and thorough analytical analysis of moving image or print text. It taught them to think about what they were reading or listening to in the media, with a critical eye. This task is now absent from the current English curriculum. In an age where our phones convey our all our media from news to entertainment, the diminishing of the importance given to critical reading and thinking skills is grossly negligent. With the speed and ease with which we now consume information, our in-built filtering system – our critical analytical skills – are more important than ever. And they are just as important to learn and apply in the classroom as they are in the newsroom. The murders of the men, women and children in Christchurch in New Zealand suffered at the hands of right-wing rhetoric that has been given a glaringly overt platform on a global level across social media. We owe it to their memory to tackle its presence online and inoculate against it through education.